cryptlib is distributed under a dual license that allows free, open-source use under a GPL-compatible license (aka the “Sleepycat” license) and closed-source use under a standard commercial license. In addition, cryptlib is often free for use in low-cost, non-open-source applications such as shareware, and for personal and research use. 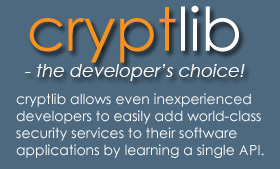 To use cryptlib under the GPL-compatible license, visit the open-source cryptlib site. Any and all large-scale commercial use of cryptlib requires a license. ‘Large-scale commercial use’ means any revenue-generating purpose such as use for company-internal purposes, or use of cryptlib in an application or product, with a total gross revenue of over $US 5,000. This allows cryptlib to be used in freeware and shareware applications, for evaluation and research purposes, and for non-revenue-generating or personal use without charge. In addition the author reserves the right to grant free licenses for commercial use in special cases (for example where there is a general benefit to the public). Contact the cryptlib Sales team for details if you think you qualify. Any software you create with this code may not be merely a set or subset of cryptlib, with or without minor added functionality or a different interface. In particular you can’t distribute cryptlib (or any modified form of it) as your own encryption or security product. This is to stop users adding their own wrappers and selling it as “their” software product. THIS SOFTWARE IS PROVIDED “AS IS” AND ANY EXPRESS OR IMPLIED WARRANTIES, INCLUDING, BUT NOT LIMITED TO, THE IMPLIED WARRANTIES OF MERCHANTABILITY, FITNESS FOR A PARTICULAR PURPOSE, OR NON-INFRINGEMENT, ARE DISCLAIMED. IN NO EVENT SHALL THE AUTHOR BE LIABLE FOR ANY DIRECT, INDIRECT, INCIDENTAL, SPECIAL, EXEMPLARY, OR CONSEQUENTIAL DAMAGES (INCLUDING, BUT NOT LIMITED TO, PROCUREMENT OF SUBSTITUTE GOODS OR SERVICES; LOSS OF USE, DATA, OR PROFITS; OR BUSINESS INTERRUPTION) HOWEVER CAUSED AND ON ANY THEORY OF LIABILITY, WHETHER IN CONTRACT, STRICT LIABILITY, OR TORT (INCLUDING NEGLIGENCE OR OTHERWISE) ARISING IN ANY WAY OUT OF THE USE OF THIS SOFTWARE, EVEN IF ADVISED OF THE POSSIBILITY OF SUCH DAMAGE.